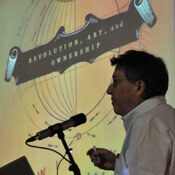 Lewis Hyde presents "The Gift and the Commons: Creativity and the Public Good." In his lecture, “The Gift and the Commons: Creativity and the Public Good,” Hyde discusses personal gifts, the creative spirit, and our shared cultural past and imagined future. A MacArthur Fellow, Hyde teaches during the fall semesters at Kenyon College, where he is the Richard L. Thomas Professor of Creative Writing. The lecture was co-presented by PNCA and Lewis and Clark Graduate School of Education and Counseling Center for Community Engagement.